The “Exile. Experience and Testimony” traveling panel exhibit is now on display in the library atrium. Five College faculty, staff and students gathered on Feb. 4 in the Stimson Room of the Williston Memorial Library for the opening symposium of “Exile. 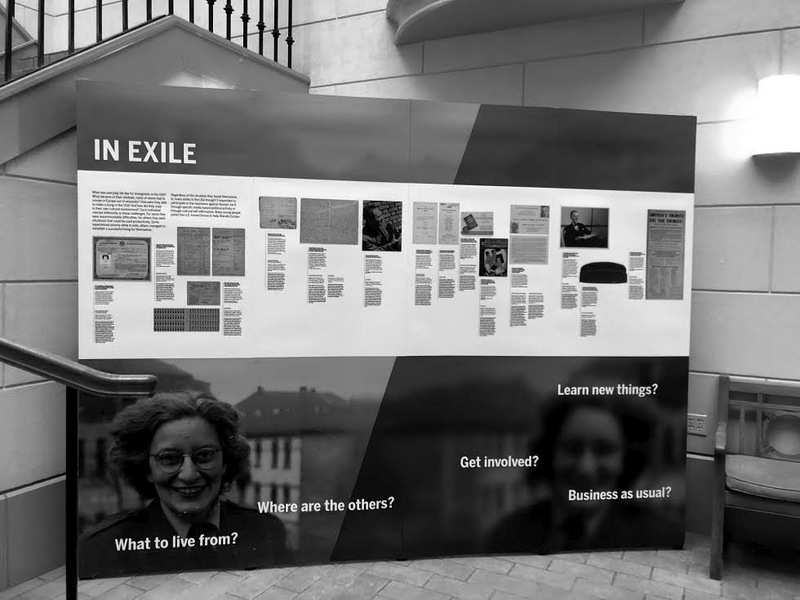 Experience and Testimony,” a traveling panel exhibit created by the German Exile Archive 1933-1945 of the German National Library. “Exile. Experience and Testimony” features reproductions of approximately 35 exhibits from the permanent display in Germany along with introductory texts of themes, item descriptions, and biographical information. According to German Missions in the United States, the displays include aid organizations that operated in the United States and the everyday linguistic and professional challenges of people in exile, as well as the resistance activities they engaged in. The symposium focused mainly on German Jewish refugees and in some instances their connection to Mount Holyoke and the surrounding area. It featured presentations by Mount Holyoke Professors Christopher Benfey and Karen Remmler, Head of Archives and Special Collections Leslie Fields and Hampshire College Professors Karen Koehler and Rachel Rubinstein. Fields presented “I have been hidden: German Student Refugees at Mount Holyoke.” From her research in the archives, Fields discovered that former President of Mount Holyoke Roswell Gray Ham created a committee to fund and admit German refugees to the College in December 1938. The committee was met with backlash from both a New York alum group and the Board of Trustees, who opposed “taking Jews exclusively” and preferred that refugees come “from other political minorities.” The committee brought in new students, but suffered logistical issues when many students were stranded in Nazi-occupied territories.